As part of an update to their 2010 Social Mom Report, BabyCenter released findings about what moms are doing online and how socially connected moms are. “Before enjoying her first cup of coffee in the morning” until she goes to bed at night (and even in the middle of the night when her she’s trying to rock her baby to sleep) she's connected. We thought it would be fun to compare the results of their 2013 report with how you live your everyday connected life. When it comes to moms, “social powers her life,” according to the study. Moms are dialed into social media platforms like Facebook, YouTube, Instagram more than the general population. These moms are also four times more likely to check social media on their smartphone, with 89% of moms using their smartphone or tablet to check Facebook at least weekly. But it’s not just Facebook that’s getting all the buzz with mom. Visual social media - specifically Pinterest - is attracting nearly two-thirds of moms (61%), who reported they’ve used the site in the last six months. 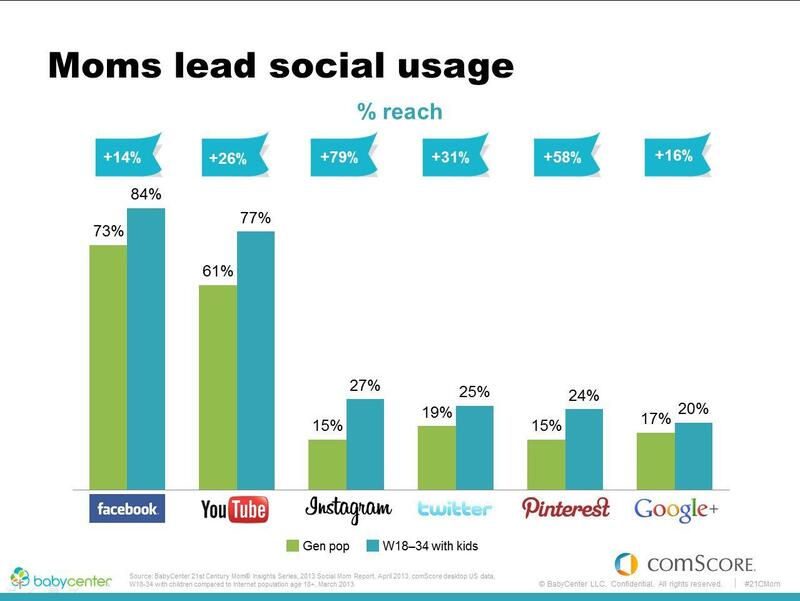 This makes moms 87% more likely to visit Pinterest than the general population. All of the social connectivity is translating into dollar signs for retailers. The “Social Mom” is spending more, a lot more according to the BabyCenter report. When it comes to certain categories, moms over indexes significantly compared to the general population in areas like photo printing (+102%), food & beverage (+96%), mobile phones (+124%) and toys & games (+82%). Social media is driving many of these purchase decisions, with 59% of moms buying a product because another mom recommended it on a parenting site and 44% of moms influenced by a friend liking or posting about a brand on a social network. So clearly social media is a driving force in how moms make decisions in their lives and clearly a powerful new way to reach parents as consumers.